Finnish rally driver Kalle Rovanperä and forest machine manufacturer John Deere Forestry Oy have signed a collaboration agreement. Rovanperä has risen to prominence in motorsports at an exceptionally young age and secured a World Rally Championship-2 (WRC2) series bronze medal in the 2018 season by winning the WRC2 events in Wales and Catalunya. 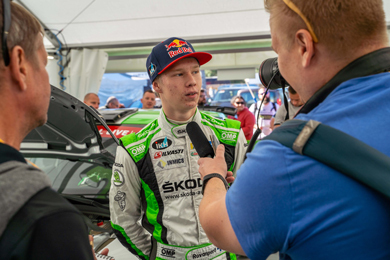 In the 2019 season, Rovanperä and his co-driver Jonne Halttunen will continue as part of the Škoda Motorsport team challenging for the WRC2 series championship. Kalle Rovanperä became a phenomenon at the age of 8 when he showed off his rally driving skills at full competition speed on a YouTube video. He has competed since the age of 10 in the Baltics, where a driver’s license is not a requirement to take part in rallying. Due to his young age, stretches between the stages were driven by his co-driver Risto Pietiläinen. Kalle Rovanperä has won a total of three Latvian rallying championships. In the 2016 season, he won the Latvian open class rallying championship and became the youngest ever driver to win a national open class rallying championship. In the 2017 season, Kalle Rovanperä was given special permission to take part in Finnish races and the national championship series. Rovanperä participated in his first WRC rally in Wales in late 2017 and was drafted into the Škoda Motorsport team for the 2018 season. The World Rally Championship-2 series is driven with production-based four-wheel-drive cars on exactly the same stages as the WRC series. In October, Kalle Rovanperä, who is a second-generation rallying star, reached the legal driving age in Finland. The Rovanperä family live in the legendary rallying village of Puuppola in Jyväskylä, Finland, and Kalle’s father Harri Rovanperä drove a total of 111 WRC events during his career between 1993 and 2006 and finished on the podium 17 times. “Rallying is a favourite sport for Finns and collaboration with Kalle will give our customers interesting rallying moments to follow. Kalle has a unique story, he has convinced us with his fabulous driving skills and he is an excellent personality to collaborate with John Deere. In addition, we will continue our collaboration with Finland’s most popular athlete, biathlete Kaisa Mäkäräinen, the Tappara and Ilves Hockey Finland teams and the Joensuun Kataja basketball team,” says Janne Märkälä, Sales Director, John Deere Forestry. John Deere Forestry Oy has been manufacturing forest machines in Joensuu, Eastern Finland, since 1972. Formerly known as Timberjack, the company has approximately 700 employees. The company’s forestry machinery product development is located in Tampere. More than 90% of wheeled John Deere harvesters and forwarders are exported.